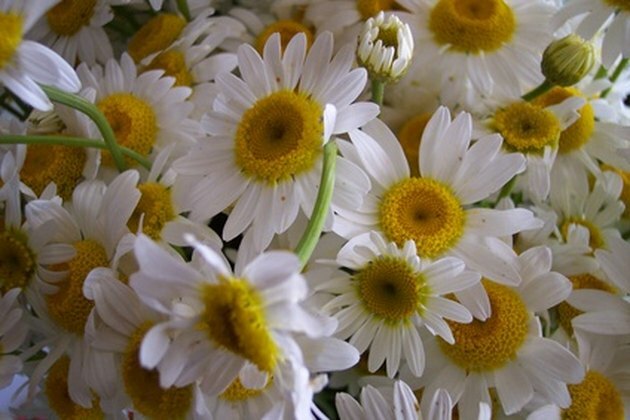 Daisies are a classic, beloved garden flower. They brighten up any yard and can be enjoyed for many years with proper care and cultural practices. Considered a perennial (in very cold regions, some varieties are considered annuals), daisy flowers are fairly easy to grow. Although there are many varieties of daisies there are some basic care tips that apply to most. The Anglo-Saxon origin of the word daisy is "daes eage," meaning "day's eye" because of the fact that daisy's blossoms open right at the beginning of the day. They are a symbol of purity and innocence. Daisy flowers are a symbol of innocence and purity. Choose an area that receives full sun exposure. Clear away any weeds and loosen up the soil with a hand shovel or a spade. Use organically rich, well-drained soil and mix in about 4 inches of compost. Plant transplants or sow the daisy seeds yourself. Space them 9 to 12 inches apart and lightly pack more soil over them. Add about an inch of mulch to retain moisture and to prevent weeds. Water thoroughly. Water regularly; if you planted seeds they will need to be watered more frequently (possibly twice a day) until they germinate, particularly if you live in a dry, hot region. Add a general purpose fertilizer early in the growth stage, or about two weeks after the seeds have germinated. At the beginning of every spring season add more mulch and fertilizer. Control pests by spraying them with a strong stream of water or hand-picking them off. Daisies usually don't have major issues with pests but if necessary you can use an insecticide on them. Remove and discard any diseased areas immediately. Treat with a fungicide if the problem becomes persistent. Cut stems down after the first frost in the fall, leaving approximately an inch of stem above the soil line. Adding a thick layer of mulch will help protect your daisies over the winter season. Bree Underwood has been a professional freelance writer and independent journalist since 2004. She is currently writing for online publications such as San Francisco Examiner.com, Suite 101, Bright Hub, eHow and Life123. She writes for two businesses in her community as well. Underwood is also an honors student studying English and journalism at Las Positas College.